These rules are strictly fantasy. Those wargamers who lack imagination, those who don't care for Burroughs' Martian adventures where John Carter is groping through black pits, who feel no thrill upon reading Howard's Conan saga, who do not enjoy the de Camp & Pratt fantasies or Fritz Leiber's Fafhrd and the Gray Mouser pitting their swords against evil sorceries will not be likely to find DUNGEONS and DRAGONS to their taste. So states the concluding paragraph to Gary Gygax's forward [sic] to the 1974 edition of Dungeons & Dragons. As you can see, Gygax places Edgar Rice Burrough's stories of Barsoom on the same plane as those of Howard's Conan, Leiber's Lankhmar, and De Camp and Pratt's Harold Shea as the foundations on which OD&D was built. Anyone who's read the LBBs closely should have no doubt about his sincerity, as they probably include more references to Barsoom than to any other fictional world, including Middle-earth. It's worth noting as well that Gygax, collaborating with Brian Blume, published the miniatures game (with limited RPG elements) Warriors of Mars contemporaneously with the release of OD&D in 1974, which says a lot about how important Burroughs was to the early hobby. Confederate soldier turned Martian warlord John Carter made his first appearance in the February 1912 issue of All-Story in a tale entitled "Under the Moons of Mars," part of a serial that would later be collected and expanded as a novel under the title A Princess of Mars in 1917. The novel begins with a letter "To the Reader of This Work" written by Burroughs in which he speaks of his "Uncle Jack," whom he remembers from his childhood as a "tall, dark, smooth-faced, athletic man" who "entered into the sports of the children with the same hearty good fellowship he displayed toward those pastimes in which the men and women of his own age indulged." According to the letter, Uncle Jack, that is, Captain John Carter, formerly of the Army of Northern Virginia, disappeared "some fifteen or sixteen years" before returning without warning, seeming not having aged at all. Carter then gave Burroughs the key to a safe in which he had written the story of what he had done during his mysterious absence and instructed his nephew to divulge its contents only 21 years after Carter's death. A Princess of Mars purports to be the story Carter had written of his adventures. The novel is therefore a first-person account of Carter's life after he went westward to Arizona to seek gold but instead finds a great deal more. Carter eventually succumbs to sleep and when he awakens, he finds himself elsewhere. (Readers will no doubt recognize a certain similarity between what happens to John Carter and what happens to Anthony "Buck" Rogers in his 1928 debut.) Carter matter-of-factly explains his intuitive understanding of what had happened to him. I opened my eyes upon a strange and weird landscape. I knew that I was on Mars; not once did I question either my sanity or my wakefulness. I was not asleep, no need for pinching here; my inner consciousness told me as plainly that I was upon Mars as your conscious mind tells you that you are upon Earth. You do not question the fact; neither did I. Not long afterward, Carter finds himself a prisoner of the four-armed Tharks, a barbaric species native to Mars, the respect of one of whose chieftains he earns thanks to the prodigious strength and agility he possesses due to the lower gravity of Mars. This chieftain, Tars Tarkas, becomes Carter's boon companion and aids him in his adventures, most notably in helping Carter forge an alliance between the Tharks and the Red Martians of the city-state of Helium, whose princess, Dejah Thoris, is the character after whom the novel is named. Along the way, though, there are innumerable obstacles and challenges Carter and his comrades must overcome, which Burroughs narrates briskly, pausing often to describe Mars in a travelog-like fashion. I don't think it's possible to overstate the influence A Princess of Mars and its many sequels had upon the development of both science fiction and fantasy literature, not to mention roleplaying games. There had been many other stories of interplanetary adventure before this tale came along in 1912, but it was Burroughs who managed to create a formula that deftly combined a likable protagonist, a believable setting, and just enough titillation -- no one on Barsoom wears any clothing, for example -- to seize the public's attention and hold on to it. There would assuredly have been other science fiction and fantasy stories without Burroughs, but I think they'd have been of a very different character, less adventuresome and more didactic. Burroughs's great gift, I think, was his willingness to treat escapism seriously rather than as an object of embarrassment. I find few insights into the human condition or the Big Questions in A Princess of Mars, but so what? Sometimes, being transported to another world, where an honorable fighting man from Virginia can win the love of a princess is more than enough reason to read a story. I love Barsoom...more than any other thing D&D introduced me (except, perhaps, Jirel of Jory) there is nothing I love more. Glad to see it finally arrive here. I find few insights into the human condition or the Big Questions in A Princess of Mars, but so what? Sometimes, being transported to another world, where an honorable fighting man from Virginia can win the love of a princess is more than enough reason to read a story. I think you sell Burroughs and similar fare short. John Carter and other escapist fantasy too often appeals to an idealized self we wish we could be. Even less adventurous entertainment, such as Lawrence Block's Scudder novels, do the same. I don't want to be an divorced alcoholic living in a single room in the Bowery working as an unlicensed PI, but I wish I could be like Scudder (who that accurately describes, at least in the early novels) just as much as I want to be like John Carter. What is common to both and to other escapist stories that I read is the character's moral choices, character, and abilities that allows them to overcome all those are ideals I want to live up to. I'd say that's a pretty big insight, into myself if not the entire human condition. 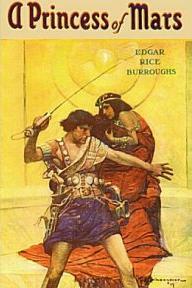 Barsoom was the first fantasy world I was ever introduced to - even before Middle Earth. Swords of Mars was the first fantasy-adventure story I ever read. Cool review, James! Personally, I think that ERB did look at a lot of Big Questions throughout his career, just not very much in APoM. Burroughs favorite method of attack was to use satire. By creating outlandish societies (much like Swift), he was able to focus on, and poke fun at, our own foibles while still delivering headlong, imaginative adventure. Hey, that's the cover of the copy I have! I'd never actually seen that until I found it in a used bookstore. Before buying it, the version I'd get at my library (which I checked out several times) was with the Frazetta cover. You actually have a Frank Schoonover cover Princess of Mars? Color me jealous. There is/was a recent comics adaptation from IDW. I read the first issue. It is Wretched. Avoid it. IMO, this is one of ERB's very best books, it a has a lurid dream like quality which I think is missing form some of his later efforts. Also, everyone is eternally youthful and naked. Yeah, picked it up years ago at a big used bookstore in downtown Detroit, of all places. Sadly, the book wasn't in the best shape. I love this series. Love, love, love. Since I was a kid. Classic pulp adventure. While Burroughs doesn't go in for the big questions in here, the simple chivalric and heroic tenets lived by John Carter (and later other protagonists like his son Carthoris or Gahan of Gathol) were definitely inspiring. And I can't deny that in moments of depression or doubt I've repeated to myself Carter's cry of defiance when he was at his blackest points, locked in some stygian pit- "I still live!" I came across APoM fifteen years ago. After browsing through a few pages, I dropped it without a second thought. There was something in that book which made me feel awkward. But what was it? For starters, Carter travels to Mars by having a fainting fit in a random cave. Unlike Buck Rogers, it doesn't seem to make sense at any rate. Burrough's could and should had bothered to make up some sort of device. A flying saucer, an star gate, an alien monolith, a magic carpet, you name it. What else? "I opened my eyes upon a strange and weird landscape. I knew that I was on Mars". It should read "I opened my eyes upon a strange and weird landscape. I knew that I wasn't on Earth". As written, it implies that Random Carter, the everyday guy, can identificate any planet at first sight -even if it happens to be an unkown world "where no man has been before". It would made sense if Carter was a seasoned astronaut, rather than a cowboy; otherwise, it's just fodder for disbelieving. What about the natives? Four-armed greenskin ogres... that's not very imaginative, but not entirely bad either -at least, they are not English-speakers. But now it comes a bare-breasted redhair dimsel. And I was looking forward for H.G. Wells' skiddies: what a dissapointment! Anyway, I couldn't force myself to read further. I jumped to the last page, in which Carter is back at Earth, save and alive -no spoilers in here, is clear from the introduction that eventually he makes his way home-. As a matter of taste, APoM does't appeal to me. I'm afraid that it's down below my standards. Stranger, you didn't read very closely fifteen years ago, if you thought you were reading about "Random Carter", the "everyday guy" or "cowboy." Looks like you skimmed at best. Burroughs did address social issues FREQUENTLY is his novels you just have to look for his satire . . .. .
“In one respect at least the Martians are a happy people; they have no lawyers.” (PM, IX). what books he should read as inspiration for DnD he handed him the Barsoom series .. .
Open Friday: Anyone Remember This? Pulp Fantasy Library: Chariots of the Gods?